The second of the Hammer Frankenstein dynasty, The Revenge of Frankenstein has been revered as one of the best Hammer films to date. A suitable, and in some ways superior, follow-up to The Curse of Frankenstein, The Revenge of Frankenstein is required viewing for any classic horror fan. Right off the bat, I have to give credit to Jimmy Sangster who wrote the film. As this was a sequel to Curse of Frankenstein, which really didn‘t need a sequel, I assumed it was going to be boring, long-winded, and asinine. I feared he was going to use the Christopher Lee-type monster from Curse and take the “oh-look-how-human-this-monster-is” route reminiscent of Bride of Frankenstein. Sangster ultimately bypassed this by scrapping the old monster and presenting us with a monster that was originally human. In Revenge, the good doctor decides to assist a deformed man by transplanting his brain into a new “stud” body made from the best parts of the deceased poor. And of course, he goes mad. This unique take on the Frankenstein tale pleased Hammer fans as it wasn’t the “same old story” rehashed (a problem with many of the Universal Frankenstein sequels). Also the plot gave the story some philosophical depth as The Revenge of Frankenstein became the ultimate tale of the superficial downfalls of man, and the consequences of vanity. Above all other versions of Frankenstein, The Revenge of Frankenstein strikes me as the most haunting as it is simply so human. 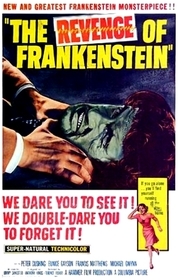 The plot alone kept my interest more than any other of the Hammer Frankensteins. Hammer did not have the capability, or perhaps the desire, to keep our interest in the Frankenstein story by shoving other random classic horror movie monsters into the Frankenstein tale like Universal Studios was so well-known for. And unfortunately, as interesting as the Frankenstein tale is, there are only several ways to tell it without being redundant. Therefore, Hammer decided to skew the tales a bit, often without success (aka Frankenstein Created Women). The Revenge of Frankenstein was one of the few left turns that they got right. This was due to the focus of the film (which they left on Cushing instead of the monster, a wonderful decision by the director for reasons described in the paragraph below), the plot itself (for reasons described above), and the action. This movie is paced perfectly, with just the right amount of drama thrown in. This is coupled with some very nice camera work, specifically in the climax. Occasionally, Hammer runs into the problem of being too overbearing with their camera work, which ends up looking over-dramatic. In this film, the camera seemed more like a passive observer, as if you were watching a documentary unfold. This enhanced the realism of the picture by tenfold. 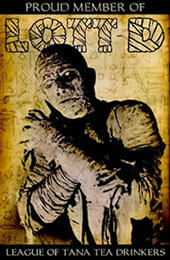 Finally, you simply don’t get better choice for Dr. Frankenstein than Peter Cushing. Even Colin Clive, who was a sheer delight in Universal Studios Frankenstein, at times seemed a little “off” as he seemed to be too much of a pretty boy to be a mad scientist. So, Universal made him a tragic, yet one-dimensional, loony-tune. Peter Cushing, however, brought a depth to Dr. Frankenstein that never had been seen before. Cushing’s Frankenstein was not only stark-raving mad, he was also evil, self-centered, slightly masochistic, but at the same time, likeable. The likeability factor came to play as Cushing played Frankenstein by dealing a bit of humor with that droll sarcasm that only Cushing has. This likeability factor was even more present in Revenge of Frankenstein just from the story line, as - despite the self-centeredness of his actions - Dr. Frankenstein’s experiments ultimately were designed to help the less fortunate. For those bored with the shells-of-a-character known as Dr. Frankenstein seen in most versions of the tale, it will be a refreshing change to see the good doctor as the dynamic character he was always intended to be. After Revenge of Frankenstein, the Hammer Frankenstein empire becomes choppy by getting-it-almost right with The Evil of Frankenstein to missing-the-mark-damn-near-completely with Frankenstein Created Woman. Luckily for horror fans, Revenge and Curse made enough of an impact on the world of Frankenstein, that the rest could almost be disregarded. Required viewing for all classic horror fans, do yourself a favor and treat yourself to a Curse and Revenge double feature.